While it’s common for most of us to get an occasional cold sore, you may suffer from regular breakouts. If so, you know firsthand how uncomfortable and embarrassing they can be and seeming to erupt at the most inopportune moments. What you’re experiencing is the result of a virus — the Herpes Simplex virus (HSV) Type I to be exact. Don’t let the name disturb you — although similar it’s different from the sexually transmitted virus known as HSV Type II. As with any virus the body responds by making and distributing antibodies to stop its attack. That’s typically the end of it but for some people the virus appears to be able to hide in the nerve roots of the mouth and elude the effects of the antibodies. 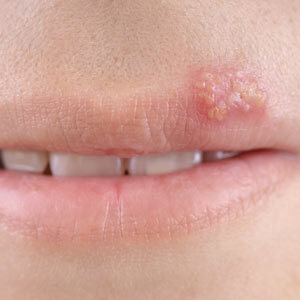 The sores associated with the virus tend to break out when a person is under stress, experiences trauma to the lip or even from sun exposure. The breakout begins with a slight itching or burning around the mouth that typically advances to more severe itching, swelling, redness and blistering. Eventually the sores will scab over and heal as the outbreak winds down. The period from breakout to final healing (during which you’ll also be contagious to others) usually lasts seven to ten days. Although normally not a danger to health, cold sore outbreaks can be painful and irritating. In the past, most patients simply had to let the outbreak run its course with topical ointments to ease discomfort.Â In the last two decades, however, new anti-viral medication has proven effective in preventing the outbreaks in the first place or at least lessening their duration. If you have regular bouts of cold sores prescription drugs like acyclovir or valcyclovir taken orally can help suppress the occurrences altogether, and have few side effects. Topical agents can also be used as a supplement to the drugs to help ease itching and other pain symptoms. It’s important, though, that you undergo a complete oral examination to rule out more serious conditions associated with mouth sores. If we find that your problem is recurring cold sores, these new treatments could help you escape the cycle of discomfort.